Fathers 4 Justice (F4J) announced yesterday on Radio 5 Live's 'Forgotten Fathers' programme that it's high profile campaign IS to continue despite the group formally disbanding in January following the alleged Leo Blair plot. 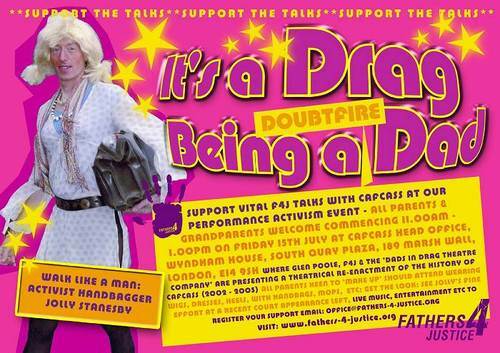 "IT'S A DRAG BEING A DAD"
This Friday 15th July a team from F4J will present to the Cafcass board in critical talks. We have been swamped with emails from you with your views which we will present to the board in a gloves off, no nonsense presentation. 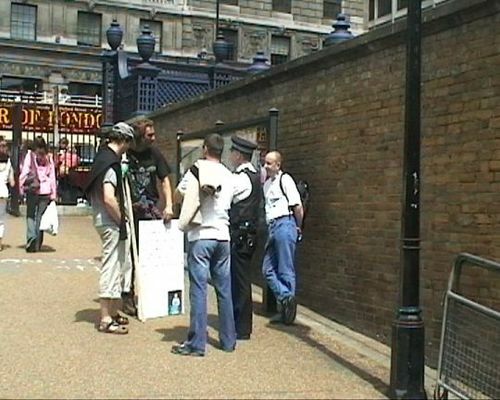 To mark the occasion and to focus everybody's minds on the task at hand, F4J are holding a 'support the talks' performance activism event outside Cafcass HQ called 'It's a Drag Being A Dad' where Glen Poole will present what is described as a 'theatrical re-enactment of the history of Cafcass between '2002 - 2005'. All parents and grandparents wishing to 'make up' should attend wearing wigs, dresses, heels, handbags etc (see Jolly in poster below). The event will feature Glen Poole as compere and a DJ. The event kicks off at 11.00am - 1.00pm at Cafcass Head Office, Wyndham House, South Quay Plaza, 189 Marsh Wall, London, E14 9SH. Nearest stations are Canary Wharf Tube and Docklands Light Railway South Quay Station. For the first time, and in response to many, many calls over the last month, F4J Members will be able to have one to one chats with F4J Founder Matt O'Connor before Friday's Cafcass talks. Matt will answer as many calls as possible between 9.00am and 5.00pm about everything including Cafcass, the campaign, recent press, political work and recent developments in the House of Lords and his vision for the future of F4J. Members can call 01787 281922 and should have where possible their membership numbers ready. If Matt is on another call he will make every endeavour to call you back. Fathers 4 Justice today announced that it would be launching a charitable foundation to work with Young Offenders from fatherless families. The Fathers 4 Justice Foundation will team up with regional Youth Mentoring projects in an effort to help highlight the work done with Young Offenders and the link be young offending and fatherless ness. The Foundation will also launch a new campaign called "Father Figure" which will tour the UK at the beginning of 2006. Said Fathers 4 Justice Founder Matt O'Connor "This exciting new initiative demonstrates our commitment to not only tackling fatherless ness but the catastrophic impact and damage on children and society. The National Audit Office last year announced that the cost to country of Young Offending was £10 Billion and that 1 in 4 teenagers was now a criminal." Mr O'Connor, who's partner is expecting their baby in December said "The initiative is part of the of the new & ongoing evolution of Fathers 4 Justice, not just as a major force in campaigning but a force for social change." No demo but some turn up anyway. There were more police than demonstrators. We had a nice drink after the non demo. CAFCASS speak with forked tongue? or a step forward? Campaign group Fathers 4 Justice has called a truce with the service which advises courts in child custody cases. 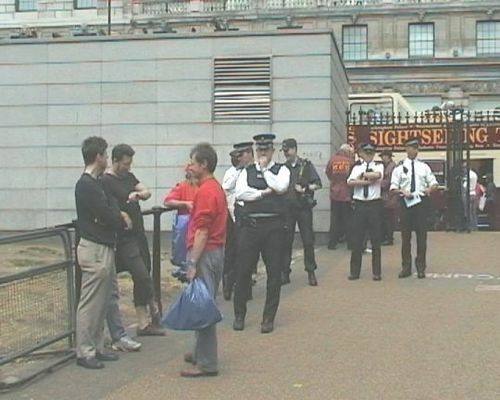 The Children and Family Court Advisory and Support Service (Cafcass) had been among the group's main protest targets. Cafcass is to issue a statement calling for "constructive dialogue" with the group, which campaigns for fathers' rights. The campaigners grew in prominence after members dressed as superheroes mounted famous landmarks. Fathers 4 Justice says it has expelled those members. Cafcass said the conciliatory tone would aid "public confidence" in them. Its chief executive, Anthony Douglas, said: "We needed to lower the temperature so that new fathers who came to us didn't perceive, on the back of those kinds of campaigns, that we were biased against them. "It's very important in our work to have public confidence and confidence from mothers, fathers and other relatives that we're going to be neutral and do best for their children." The advisory group writes reports on families and recommend who gains custody of children, as well as the amount of access given to the other parent. In the past Fathers 4 Justice had claimed that Cafcass helped to create an institutional bias towards mothers being given custody of children and too little access to fathers. A statement expected from Cafcass is also expected to stress the importance of a continuing relationship with both parents in custody cases. Matt O'Connor of Fathers 4 Justice called the move "a significant leap in the mindset of Cafcass as an organisation". "When we first started they said 'what problem?' Now we have them seriously addressing and recognising the rights of children to see their fathers." Fathers 4 Justice members have conducted a number of high profile stunts, including climbing a wall at Buckingham Palace last September. And last May Tony Blair was hit by packages of flour thrown by members of the group while speaking in the House of Commons. 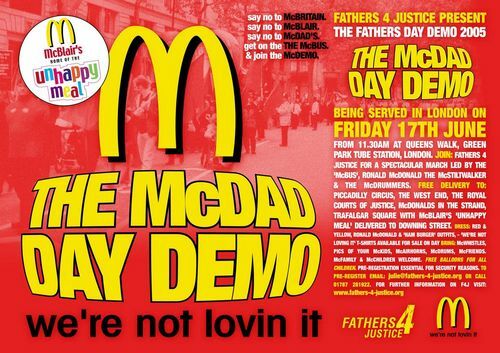 Campaign Group Fathers 4 Justice today rejected Government proposal's expected to be contained in the Queens' Speech today with regard to the enforcement of parental contact orders describing it as 'McDad' legislation that will see thousands more children reduced to meeting their fathers for a few hours in a McDonald's every week. JOIN Fathers 4 Justice for a spectacular march led by 'McBus'. Ronald McDonald The McStiltWalker and the McDrummers. Angry fathers - including some from campaign group Fathers 4 Justice (F4J) - have 'locked out' over 70 Labour offices including many belonging to Labour MP's.